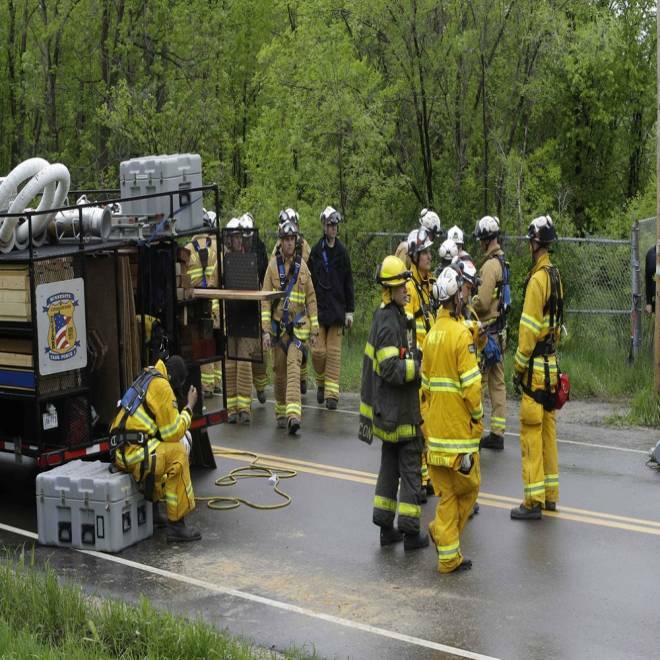 Rescue personnel gather near an entrance to Lilydale Regional Park above the Mississippi River during a suspension of search efforts to find a fourth child missing after a landslide swept over a group of children on a fourth grade field trip Wednesday, May 22, 2013, in St. Paul, Minn. Authorities recovered the body of a Minnesota child who went missing after a gravel slide swept several members of an elementary school class on a school fossil-hunting trip into a pit, bringing the death toll in the incident to two. Crews recovered the boy’s body on Thursday after bad weather briefly let up, St. Paul Assistant Fire Chief Jim Smith said, according to NBC News affiliate KARE. The boy’s family had been notified, Smith said. The fourth-graders from a St. Louis Park elementary school were hiking in Lilydale Regional Park on Wednesday when a steep slope soaked by rain gave way, authorities have said. Two trapped children were dug out by firefighters who clawed away gravel with their hands and shovels, they said. “It appears they were walking along and the ground, after the rain we’ve had, was so soft and it gave way and they fell into what became a hole and the earth came on top of them,” St. Paul Fire Marshal Steve Zaccard said at a news conference, according to KARE. 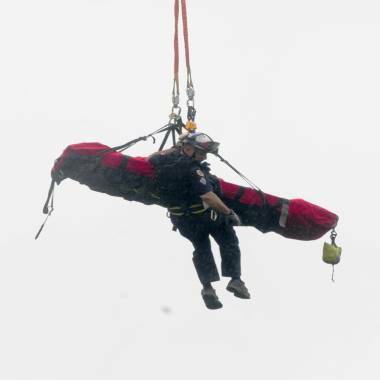 An emergency worker attends to a person on a stretcher, being evacuated out of a rockslide site by helicopter, on the West Side of St. Paul, Wednesday, May 22, 2013. One of the children pulled from the pit later died, and has not yet been identified by authorities. One child injured in the slide has been released from the hospital and another remains in serious condition, officials said on Thursday. The search for the missing student was suspended overnight as rescuers battled worsening conditions. A man who identified himself as the missing child’s uncle said the student “liked geology,” according to the Minnesota Star Tribune. “Thoughts and prayers go out to the families of the children and to our first responders who continue to deal with the situation as it develops,” said St. Paul Mayor Chris Coleman.